Congratulations, we are in BONUS time this month thanks to getting on top of the posts earlier than usual. I’m off today and relaxing a bit after spending the morning taking down on the exterior Christmas decorations – before you comment that it is a little late for that, I technically had them turned off as of the 12th which is my Christmas is officially over date. The two big snows of the year still have not dissipated much so it was quite the task to get this done – need to get all the extension cords thawed out so they can actually be looped. I also decided to shovel off Serenity (link here) in effort to keep the stress off the span. That was work just getting down and back on the big hills – next time taking the snowboard! Enough bantering, on with the featured bird of the day. Figured I would go ahead and make another check in the Bird List today thanks to a surprise capture while up at Chain O’ Lakes State Park. This has become one of my favorite parks not only for the multitude of birds shot up there, but the trails are also long and hilly – perfect for the 1/2 marathon training which is usually in flight whenever we get the opportunity to head up there (typically for dog shows). While looking through the bounty from that trip I noticed this image and decided to investigate a little more. These were taken at one of the back (often mucky) marshes off the main campground road. We always make a point to hit this particular spot since it seems to always have some interesting wildlife hanging out – deer, ducks, snak… umm forget that last part. The wildlife tends to keep at the back edge of the pond making it pretty difficult to get anything beyond bird list shots. These were heavily zoomed in just so you could make out the bird at the cost of quality. The feature that immediately caught my eye was the long white stripe. Hit the jump to find out what this bird is and read up a little bit on its background. I am familiar with a number of other birds sporting a similar stripe but it was either in a different location, a different pattern or the rest of the coloring was off. To the reference books! After a little bit of searching the identification was made … compared to the eternity usually spent with the likes of sparrows and other non-distinct birds. 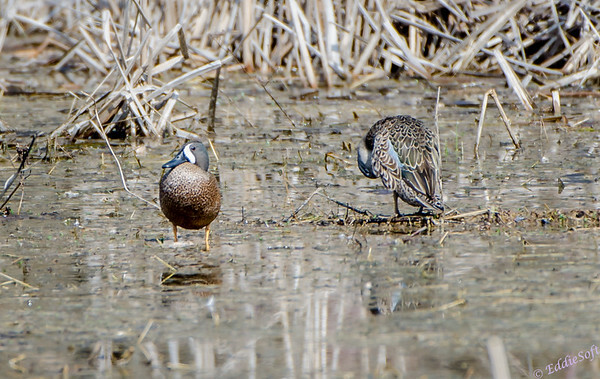 This is a Blue-Winged Teal. Note, wish the background wasn’t so busy in the following shot – really makes it hard to see the bird otherwise it it came out really nice – you probably didn’t even notice there is a female in the lead. 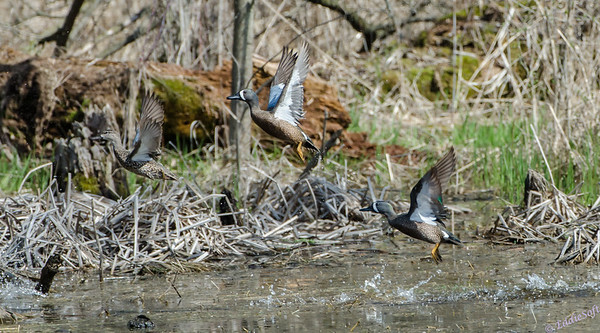 Their sister species, the Green-Winged Teal, has already made their debut on the web back in May ’13 (link here). That one was shot in Henderson, Nevada, another favorite birding place of mine. That one has such a different palette that all the Teals were left off the original few searches. Luckily there were males around because it is doubtful I could have made the identification with just the females. How about some facts about this new bird. Cornell confirmed that they are marsh birds preferring to stay under cover which aligns with the shooting location. They are dabblers, which I didn’t get to witness in action while there. Most of their time was spent preening and keeping a wary eye on the banks where I was trying to blend in the best I could. The shot above was a result of trying to move to get a less cluttered angle – remember the golden rule people: always shoot first and then move! These Teals are grounded during their late summer molt. They are the second most abundant duck in North America – second only to the Mallard. This amazes me seeing how long I’ve been a bird enthusiast and this is the first time I’ve gotten them in the tin. Mallards on the other hand are everywhere we go to the point that I usually just take a quick shot of them now and move on – same goes for the Shovelers. Base on the previous fact it is probably pointless to mention they have a Least Concern Conservation Status (but it does allow me to say yea!). They are ground nesters making them vulnerable to mammals and snakes. Apparently Crows and, where present, Magpies also take their toll on their nests. Based on our friends over at Wikipedia. 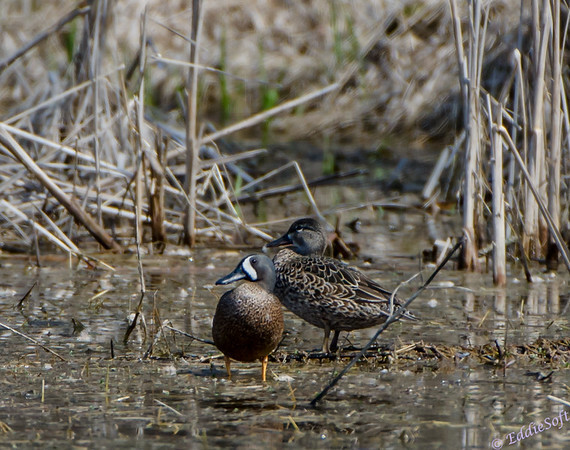 these Teals are closely linked genetically to the Cinnamon Teal. As a bit of foreshadowing, I now have one of those thanks to the last trip out to Yellowstone – the next big shoot I will start working on – that will likely fill up a bunch of posts so be looking for that. All rested up now and time to get to work on other things that need taken care of around the house. Hope you enjoyed the extra post! 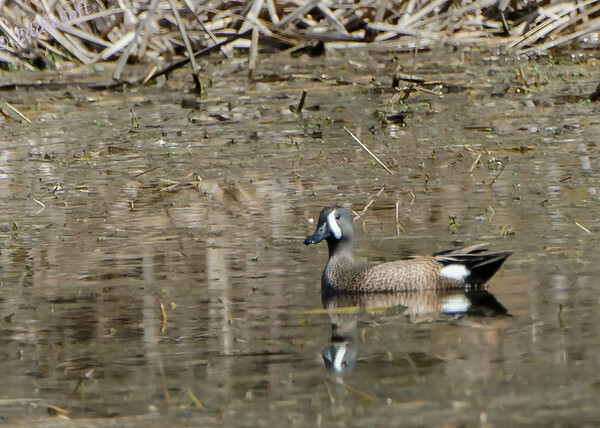 For the second most common duck in North America, I don’t think I’ve ever seen a Blue-Winged Teal either! Kind of a redundant name, really. Really pretty birds with their wings out. As for Crows, they’ve never really recovered around here from the bird virus of about 10-15 years ago. Hard to remember that cawing was always going on in the background–now it gets my attention when I hear a caw or see a Crow. Thanks for the pictures. Amazing how many ducks there are laying around just preening themselves–we need to get them working. Great idea, let’s get these damn ducks working – maybe sorting our recyclable trash for us although that might interfere with my naked convict concept but we can work that out later! We have Crows here – I tell Linda they are intermingling with the Ravens out West and making a bigger better Crow because these ones around here are huge compared two what I remember growing up.